Want to see some pictures of the layout? Well, you've come to the right place. We'll start this section by presenting photos of an Historic Event, the first runs of trains on the Louisiana Central Railroad. Admittedly there won't be any scenery or buildings for quite some time, but eventually they will appear and I'll post photos from time to time as various scenes come into being. 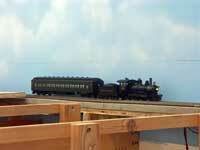 In the meantime, there are also some photos of the layout under construction. Click here to go there. February 9, 2013: An Historic Event occurred this day on the Louisiana Central Railroad when the first trains rolled across the line. The first train to traverse the rails was powered by engine number 5582, an ALCO RSD-5 recently purchased from the C&O Railroad. 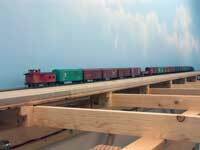 She hauled a short train of assorted box cars over the line after which the Road Foreman declared the trackwork solid and train-worthy. She was later followed by the railroad’s number 83, an ancient 4-4-0 steamer, hauling the road’s ex-commuter day coach. The car was packed with the “brass”, many railroad employees and a few railfans that managed to finagle a ride. All went well during the festivities with nary an incident. Full disclosure: well, they rolled through the staging area for the railroad which is as far as the line has gotten at this point. However, this staging area represents the line between Willis and Bude, Mississippi, and that’s a long way! But the important thing is that trains rolled under their own power. 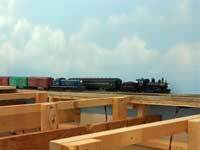 2/09/13: The first train to roll on the Louisiana Central Railroad. The inaugural train roars by at high speed! That's a 2% grade the train is tackling. 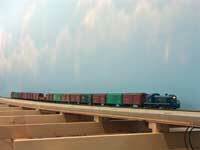 Shortly after the freight, the first passenger train traversed the line. Finally, the two trains pull up together and pose patiently for the company photographer.